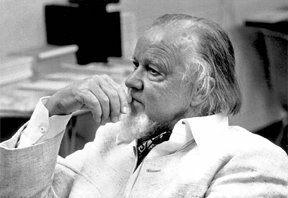 I came across the writings of Francis Schaeffer a couple of years after his death when I had been in ministry for four years. I was young and wrestling with many issues, and boy were his writings exactly what I needed to help me see the heart of God. His clarity of thought, amidst the religious jargon of the day was a fresh breathe of air to my young soul. My favorite writings of Dr. Schaeffer are those which deal with personal holiness and spirituality, the church’s responsibility before a watching world, and how secular philosophy invaded the Church’s communication of truth. I suspect, if Francis were alive today, that he would be saying much about the lack of respect and humility we see in the modern church. The language of division between various camps would certainly break his heart, and he would help sharpen the focus of our call and mission. He would instruct the present day leaders to tone down the public rhetoric toward brothers and get focussed on the real issue…declaring by word and deed that Jesus is The God Who Is There! There is so much which could be said. However, I want to share a couple of things about this man which, I pray, will help encourage another generation to read his writings. Dr. Schaeffer never ran from his own struggles. He shares a story how he paced back and forth in the attic of their house in Switzerland investigating his own belief as to whether God actually existed. This brute honesty gives hope to all who have ever wrestled with questions of faith or God. I often thought about this honesty when I was going through cancer treatment. (Ironically, I was diagnosed with the same type of Cancer which took Francis’ life.) I found that the Lord drew exceptionally near as I questioned everything…I mean everything. I had the comfort and surety of how the Lord would not run from our questions because of the testimony of Dr. Schaeffer. This led me to an understanding about the honest questions presented to God by the biblical writers. (Job, David, Jeremiah, etc..) When we are real and honest with God during our trials, the Bible is taken out of the dusty rooms of theological loftiness, and revealed to our hearts in fresh ways as we trod through the ditches of life. To the right is a picture of Francis working on correspondence. He had no great office with armed guards or jacuzzis. He did not even have a desk. His life was given to communicating truth…that is, the ideas which has the power to change a person’s heart. 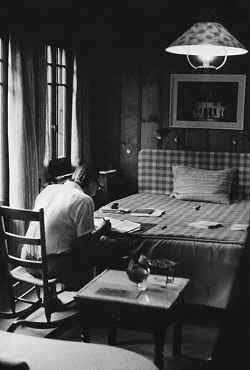 Look at the simple chair pulled up beside his bed, as he answers the many questions which came his way and works on manuscripts. Reading through the sacrifice he and his wife Edith made in those early years at L’Abri reveals a living example of hospitality and ministry. The dining china and gifts from their wedding were pretty much destroyed by the continual influx of drifters and hippies who wanted answers to life and needed a place to stay. Most had abandoned the belief that life had a purpose and existential meaning. Francis demonstrated that the God of the Bible was There And Not Silent! After many years of obscurity in the Swiss alps, Dr. Schaeffer became a popular speaker at major universities and symposiums around the world. A close friend of mine related the following story which happened after one of Dr. Schaeffer’s lectures at a Seminary. Yes, speaking to men in need was more important than speaking to those who loved the sound of their own voice. Francis lived the Gospel…it was not a message to be shut up in the rooms of intellectuals and believers. It was a message to be taken into the highways and hedges, compelling all to come in. I grew up a fighter. I think it was part of God’s sovereign plan to prepare me for the willingness to enter the fray. However, when I first began fighting, I did not like it. It seemed dumb for the most part and made me feel I had a neanderthal mentality. Then, there came a place where I liked it. I embraced fighting as a ‘king of the hill’ paradigm among humans. After I came to Christ in 1980, this was a real struggle. I no longer swung with my fist, but my tongue could be acid and relentless. The Lord used Francis to pen a paragraph that pierced my heart and has stuck with me for over 24 years. This quote literally brought me to my knees in brokenness and confession of my sin and pride. That moment was one of the aha moments we have along our spiritual journeys toward maturity. It demonstrated how communication is the wing upon which truth flows, and that only “Truth spoken in Love” (Eph. 4:15) is proper as a believer. Dr. Schaeffer had an enormous impact by pointing out the dangerous and legitimate purpose of theology. It is not to be an exercise of pride or arrogant posturing for the believer. Sound doctrine is to be a spring board into the heart of God, by answering the questions which men have about truth. But beyond the intellectual satisfaction, it is for bringing us deeper into intimacy with our Risen Lord. Discussing theology, Francis warned of the danger of holding correct doctrine as the final point of integration, instead of Christ. This is as true as ever. I pray every leader would really understand this insight shared by Dr. Schaeffer. Theologically, we can be as straight as a gun barrel, but just as empty. Intimacy with Jesus is to be our one and only integration point. I could share many other ways Francis influenced me, as I have read all 22 of his books. His words were like cool spring water satisfying my thirsty and searching heart. We could discuss his “Man with a capital M,” or “Taking the roof off” apologetics, or his “Upper and Lower Story view of philosophy.” Dr. Schaeffer gave us many unique terms which help us understand his thinking. He would have turned 100 years old this year. He has been home with the Lord for 28 years. I never had the honor to meet him. However one thing is for sure, I’ll see him one day…and what a day that will be. I can’t wait to thank him personally. If you are in ministry do yourself a favor, get some of his books and read through them. You may not always agree with him, but one thing is for sure, you will be convicted to think through issues about truth, faith and spirituality which you may have never considered. That was one of the unique gifts Francis Schaeffer gave to us! Thanks David…it is amazing how one man’s simple obedience can have an effect on so many! Heaven is going to be the ultimate Church Service!